There's no place like the produce section of a grocery store to promote a healthy-eating campaign, and that's just what first lady Michelle Obama did at a National Supermarket in Tampa, Fla., on Thursday, right around the time the GOP hopefuls went head-to-head in the Florida debate. The appearance was a component of her continuing efforts to garner national enthusiasm for health and wellness. The "Mi Plato"/"My Plate" program she discussed is the USDA's new educational tool to assist families in making healthy food choices. It replaced the food pyramid, which many felt was out-of-date. For the colorful photo opp, which had her posing against a display of fresh veggies, Michelle went dark in a sleek black dress with white and gray detailing. Sporting medium-height black pumps, the first lady looked confident and serious while addressing the crowd. Although honestly, the pictures always come out great either way. Bright fruits and vegetables make an awesome backdrop. 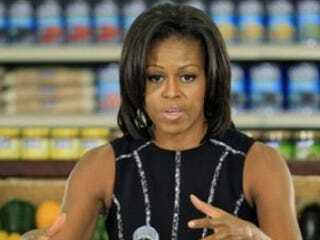 See Michelle Obama's latest supermarket visit. Do you like the black dress or does it seem a bit formal for the setting? Read more at Bay News 9 and the Huffington Post.